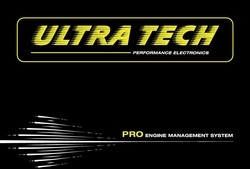 ULTRATECH PRO EMS is an advanced engine management system for sequential injection and ignition of spark ignition engines, suitable from small 4cyl street machines to drag monsters. Sensor failsafe with ‘check engine light’ functionality. Stable electronics, user-friendly software. Built-in barometric pressure, 4bar MAP, wideband controller, EGT controller and all this in a very afforbable price. Can you really ask for more? Built-in 400KPa (4bar) map sensor. For higher boost applications, you can setup any 0-5v MAP sensor and bypass built-in sensor. PID closed-loop boost control. GEAR/VSS/IAT/EGT correction tables. Wastegate spring pressure plus 2x closed-loop boost pressures with external switches.